Palapa houses have been a mainstay of the tropics from Mexico to Tahiti. They combine an open architecture with a palm thatched roof that allow the breezes to pass through the house making them very comfortable in the afternoon heat. As well as ventilation, the open nature of a palapa provides an opportunity to view the surroundings be they a tropical garden or a view overlooking the water. 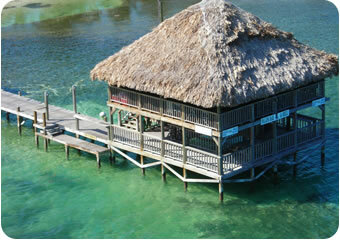 Classically defined, a palapa is a structure with a thatched roof made of palm fronds. They range from simple thatched umbrellas to very nice homes. The walls of palapa houses normally surround the house and partially or completely reach the roof line. This construction enables enclosing the private areas of the house but provides the opportunity to open up views and breezeways. Palapas are very popular for beach restaurants and bars. 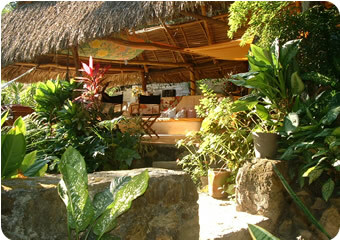 Yelapa's main beach has 5 palapa restaurants that shade you from the sun yet let you take in everything around you. The majority of the traditional houses in Yelapa are palapas. They are part of the original charm that began to draw people to Yelapa in the 1960's. © 2013 Michael Conkle. All Rights Reserved.